Choose from 6 hotels and guest houses in Stirling. Shown below a just a selection of the hotels available. To search within an area please use the menu on the right. Bramblewood - This friendly, family-run bed and breakfast accommodation is situated in the peaceful village of Drymen, offering beautiful natural surroundings and complimentary tea or coffee. Bramblewood acts as a warm, welcoming base from which to tap your host's local knowledge of this striking area on the eastern side of Loch Lomond. A caring and personal touch will provide you with economical and comfortable accommodation, situated within a tranquil woodland setting. Having been recently developed, upgrading its exceptional bed and breakfast standards, 3 well-appointed en suite rooms offer benefits such as a private TV. Enjoy free tea or coffee on arrival, along with a private dining area overlooking the gardens. It is here that you can savour a full cooked Scottish breakfast or an extensive continental alternative before embarking on your discovery of Drymen, central Scotland, Loch Lomond and the Trossachs. Abbotsfordlodge - With a 4-star Visit Scotland award, Abbotsfordlodge is a spacious Victorian property, refurbished in a contemporary style. It is located on the edge of Loch Lomond and Trossachs National Park. Abbotsford Lodge is within walking distance of all amenities. There is off-street parking, with an area for motorbikes and secure storage for cycles. Walking, pony trekking, water sports, golfing and fishing are nearby, and Abbotsford Lodge has drying facilities for wet-weather gear. 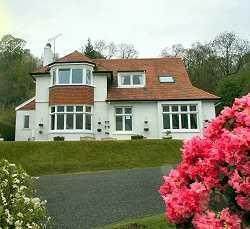 Hillview Cottage - Hillview Cottage offers B&B accommodation in central Scotland in an ideal touring location. Stirling Castle, the Wallace Monument, Loch Lomond, Edinburgh, Glasgow and The Trossachs are all close by. Day trips to Oban, Skye, St. Andrews and even Inverness are all possible. All our rooms are en suite and on the ground floor, which offers a high level of comfort, privacy and safety. We have 2 large lounges for the weary traveller to rest and relax after a day on the trail. Wi-Fi access is available. Enjoy good service tailored to your individual needs at Hillview Cottage. The Knowe Guest House - Located in Rob Roy country, beneath the famous Crags, The Knowe provides excellent accommodation to all types of travellers The guest house has many original Victorian and Edwardian features, and natural woodland borders it to the rear. The front rooms overlook the picturesque town of Callander, Gateway to the Highlands, and enjoy truly magnificent views down the valley to the Loch Lomond and Trossachs National Park, an area famous for history and beauty. The Knowe has en suite family rooms that incorporate some features found in junior suites. 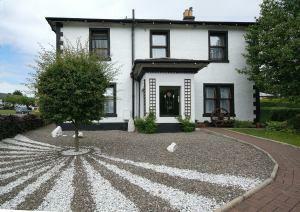 The Hawthorns - This traditional Scottish bed and breakfast is situated in the heart of picturesque Drymen, the first stop on the West Highland Way and at the beginning of Rob Roy Way. The Hawthorns is a comfortable resting place if you wish to explore the delights of the surrounding areas of Loch Lomond, the Trossachs, Stirling, Glasgow and Edinburgh. The village of Drymen boasts excellent pubs and village stores. All rooms at The Hawthorns are carefully decorated and finished to a very high standard. In the morning, a traditional Scottish breakfast is served in the dining room. Oak Tree Inn - On the east shore of Loch Lomond, this charming family-run country inn is constructed from locally quarried slate and offers a perfect tranquil location for a romantic or relaxing break. Standing in the shade of a magnificent 500-year-old oak tree, this traditional bar/restaurant is ideal for those wishing to escape from the rush of modern day life. The non-smoking inn is adjacent to the West Highland Way and is ideal for walkers. After a long day spent exploring the region's magnificent scenery and breathing in the invigorating fresh air, you can satisfy your hard-earned hunger with a delicious meal. Food is served all day and the bar has a cosy, welcoming atmosphere and a real log fire. The charming, homely en suite accommodation is warm, welcoming and comfortable. Relax and enjoy the natural tranquillity and stunning scenery of one of the most beautiful and romantic places in Scotland.